(CNS): Police arrested 32 people over the holidays for DUI and another 17 for driving when they were disqualified or not qualified, as part of the annual RCIPS road safety campaign 'StayAlive'. According to the RCIPS statistics, by the end of the campaign on Sunday, officers had dealt with 160 road smashes, an average of more eight collisions per week over the five weeks since it began on 29 November. 82 drivers were fined for using their phones behind the wheel and another 67 were ticketed for speeding. Police pulled 26 people over for not wearing seatbelts and dealt with 212 traffic offences of one kind or another. 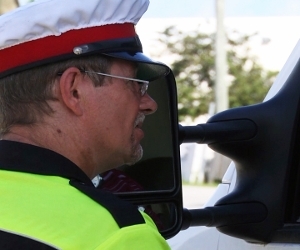 During the campaign police detailed the numbers each week hoping to deliver amessage to drivers who were drinking before getting into their cars, using their phones behind the wheel or committing other road and vehicle related offences that they would be caught. But the 49 arrests and almost four hundred tickets demonstrates that many local drivers did not take heed. The worrying level of road smashes also illustrates a serious problem on the local roads, where on average more than one collision is happening every day. I'm still laughing! 212 offences detected? Gosh, they must have caught almost, not quite but almost, 1% of the offences I saw committed during the same time period! Now provide the stats on the number of crimes they solved!! Only 32 people arrest for DUI, what a joke. I was out quite a bit over this period I only saw one road block and the police office didn’t even speak to me, just waved me by, they have no clue what they are doing, In fact I. Don’t think these officers really care all they want is their pay cheque. All I don’t want to hear now is that dumb female chief inspector. Come on the news or radio and say what a successful operation this campaign was, because it wasn’t. I propose the "StayAlive" campaign is in effect from 1 January to 31 December every year. The driving habits of many people here are completely unacceptable. A crack down for a few weeks a year along with a few ads on the radio does absolutely nothing to change driving habits and correct the situation. There would be far fewer accidents on Grand Cayman if the basic rules of the road were followed by everyone behind the wheel. How many of the "212 traffic offences of one kind or another" were for children riding in vehicles on someone's lap? Adults can choose whether they want to wear their seat belts for safety and to obey the law. If they don't wear a seat belt and are injured in an accident or fined by the police they have no one to blame but themselves. A small child is not capable of making this decision. The parents need to be responsible and ensure the safety of their children. If parents think children don't need to be in a car seat or wear a seat belt because we don't drive fast enough here to be injured in a collision they need to be shown just how much damage can be done in a low speed collision. As simple way to demonstrate this would be for the irresponsible parents to run as fast as they can into a solid object (ie brick wall) without slowing down or putting out their arms or legs to brace themselves. Once they regain consciousness they need to imagine how much that would have hurt if they were travelling at several times that speed and the brick wall is coming at them at the same speed or more. It also begs the question what other dangers are these children exposed to if the parents don't have enough sense to make sure they are safe in a vehicle? The jail is full of people who have done nothing more than consume a bit of ganga but how many are in there for putting their children in serious danger by not having them properly restrained in a vehicle? and now we go back to normal where everyone gets away with everything on the roads. This "campaign" is part of the Police duties and it should be normal day to day routine to catch traffic offenders. DUI drivers are like cockroaches, for eveyone you see there are 50 more you don't…..
Just an indication of the attitude of many drivers in Cayman. Ramp up the penalties for serious driving offences. Minimum $1000 fine and two years disqualification for conviction on DUI charge – minimum $2000 fine and one month imprisonment and three years disqualification for conviction on DUI charge when more than double the legal limit. Minimum $2000 fine and three months imprisonment for driving when disqualified – and disqualification extended for another three years. Minimum $5000 fine and six months imprisonment, and disqualification for five years, for driving uninsured – there can be no more heinous driving offence than to be possibly responsible for killing, or at the least maiming somebody, when their dependants have no capacity to make a Third Party claim against the driver's insurers. Similar penalties should apply to those convicted of DUI and injuring Third Parties, when that conviction voids any insurance cover they have. Etc/Etc..
As for speeding offences – where are the bloody cameras – potentially huge revenue and the release of patrol cars and officers to do more important work. And if the Commissioner and/or the MLAs think this sounds Draconian, let's see how they feel if one of their's is a victim of a speeder or DUI driver. Agree. Very simple and extremely effective. Until they sit outside bars as they did in the UK 40 years ago and breathalyse anyone who moves off without putting on his lights or some other infringement, we will never make progress here against drunk driving. It's part of the culture like eating endangered species, selling slaughtered beef under trees and letting forbidden and dangerous breeds of dogs roam the place and selling their puppies, despite what the laws say. How is it that a Govt official ( a policeman) is able to hit a person walking along the road the other day whille drunk driving and the person that he hit chooses not to press charges ..How does this matter? shouldnt the Crown charge the driver regardless of what the victum wishes. I just dont understand Is this how it works? Of course the driver would be doing the honorable thing and tendering his resignation . . . .